Episode Review: THE WALKING DEAD, "Made to Suffer"
Last season, The Walking Dead proved that it knows how to prepare for a long hiatus with the barn massacre, and this time around it was up to the assault on Woodbury to keep viewers on the hook until February. While I cannot say that "Made to Suffer" was as strong of a mid-season finale as "Pretty Much Dead Already," it was still a very decent installment in a markedly better run. The episode kicked off in the woods as a new group of survivors, led by Tyreese and Sasha, were fighting off walkers. After one of them was bitten, they came across a breached fence and the rubble of a building. As it turned out, it was the prison. Once inside, the newbies still had to fight off zombies, but their commotion caught the attention of Carl who decided to help them out. He even took them back to their cellblock but locked them away to ensure his people's safety. Meanwhile at Woodbury, the Governor decided to send Glenn and Maggie to the "screaming pits," but they were able to fight off Merle and his men which alerted Rick and the rescue party to their location. Thanks to smoke grenades and military precision, Rick was able to get his people back but he lost track of Michonne along the way. As they made their way to the wall in the midst of a firefight, Rick thought he saw Shane coming after him and his brief hesitation ended up costing Oscar his life. They were able to make it out safely, but their numbers were smaller due to the loss of Oscar and the missing Michonne and Daryl. As Rick and his men tried to free Glenn and Maggie, Michonne took it upon herself to get even with the Governor. She sneaked into his apartment and channeled her inner samurai as she laid in wait, but a loud noise from behind a door caught her attention. After kicking the thing down, she learned about the Governor's wall of severed heads and his biter daughter. She was about to put Penny out of her misery when the Governor showed up in the nick of time and pleaded to have her released. Instead of showing mercy, Michonne ran her sword through the back of Penny's head, and then a brawl broke out that left the Governor with only one eye. Luckily for him, Andrea barged in before Michonne could do anymore damage, but it was clear that the former friends had picked their sides. A patched up Governor addressed his community and vowed to make the invaders pay, and he tossed Merle to the wolves by claiming that he led Rick and his group to Woodbury because of his brother. He then brought out a hooded Daryl and asked his citizens what should done with the Dixon boys. As the mob cried for blood, Andrea looked on in shock and horror. While the Governor was calling for a public execution, Michonne met up with the others and reminded a distrustful Rick that they needed her help to either get back to the prison or to help save Daryl. Man, a lot happened during "Made to Suffer" and almost everything landed. For me, the best part of the episode had nothing to do with Rick's rescue mission but with what was going on in the prison. Over the first two seasons, Carl became more of a joke and the source of Internet memes than a productive character, but his growth over Season 3 has been admirable, and it was only fitting that he'd be the one to save Tyreese's group. He's prematurely become a man in front of our eyes, and he very well could be the most important person when it's all said and done. 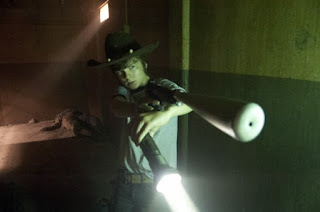 Carl's now a far cry from the kid egging on stuck walkers and getting Dale killed, and I cannot help but applaud the show for his evolution. As for Tyreese, apparently he's a fan-favorite from the comics, but since I don't read them I was a little confused by a random group of people just showing up, and for a second there I thought they were apart of a time jump forward when I realized that they were seeking refuge in the prison. I pictured the crumbling facade as a remnant of the battle between Rick and the Governor. From the little we saw of him, I have a good feeling about the character and cannot wait to see what role he'll play in future episodes. Sasha... not so much. The Woodbury scenes were more problematic, which shouldn't be surprising since that's been true throughout these first episodes. Everything that had to do with Rick busting out Glenn and Maggie worked for me. These scenes had the right amount of tension and action, and I was on the edge of my seat especially when Daryl learned that his brother was alive. The only drawback was the stuff that was going on around them. Andrea's transformation from star-struck groupie to wannabe badass was somewhat in character but still mildly annoying, but it was kind of worth it when she interrupted the utterly pointless fight between Michonne and the Governor because at least she brought a shred of importance to that moment. My main issue with the brawl had to do with the fact that it was between a character that we're not supposed to like and one that we barely know. Usually, in these kind of situations there's someone you're genuinely pulling for, but so far The Walking Dead has completely squandered the opportunity to flesh out Michonne, so her face-off with the Governor meant absolutely nothing. I guess I could give the debacle some credit for trying to humanize the big bad of the piece, and I did feel a little bit for him when Penny's skull was impaled, but he too has been so poorly conceived that the fallout didn't feel earned. In the end, the entire fight occurred between two people I don't care about, so I had zero rooting interest whatsoever and I would've much rather spent time with Rick, Daryl or Carl. Glenn giving Maggie walker bones to kill a guy was brilliant... and gross. They killed Oscar but kept pervy Axel around? What's a brotha have to do to survive the zombie apocalypse? How long before Carl kills Axel for hitting on his woman? When did Rick and Daryl become a legit strike force? Speaking of Daryl, he has to survive Woodbury right? Oh never mind, the promo for episode 9 pretty much answered that one for me. At least we know that Carol's not a lesbian. "Sasha, back away from the door and let the man go." Beth: "Shouldn't we help them?" Again, "Made to Suffer" couldn't really compare to last year's mid-season finale because it lacked the insanity and emotional punch that "Pretty Much Dead Already" had but I'm okay with that. I'll take a capable episode within a better overall season over a crazy bananas one that was the highlight of a mediocre season any day of the week. Either way, I cannot wait until February.